Lynn: The Masconomet Chieftains bench greets senior captain Colin Shepard (10) after Shepard scored on a second inning single by sophomore Ben Panunzio during Masco's Division 2 North semifinal game against Gloucester at Fraser Field in Lynn on Wednesday. 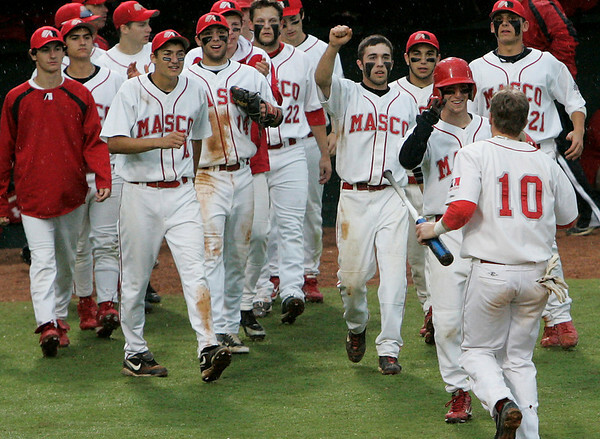 Shepard scored Masco's ninth run of the game on the play, and had tripled home senior Braden Kowalski, who had also hit a triple to reach base, in his second inning at bat. Photo by Matthew Viglianti/Staff Photographer Wednesday, June 9, 2010.